If you decide to go to Providence, Rhode Island then you are going to get a lot of questions as to why. Even residents will be befuddled as to why you have chosen their city for a visit, especially in November when the days are short, the nights are cold and the snow has begun to accumulate on the ground. I had no good answer, because I couldn’t remember how I first came up with the idea to go to Providence, but once I get something in my head it is hard to shake it loose. But I think it had to do with wanting to experience something different than the city life I was accustomed to. Despite urbanites desire to believe otherwise, cities of a certain population are more or less the same. As the years roll on and the inevitability of gentrification becomes realized, big cities become highly sanitized versions of their former selves. Megalopolises like San Francisco, New York and Los Angeles have legacies to fallback on, and for that reason you can feel where the complacency has crept in. The American Dream has already come for a visit and long since found its final resting place. With the inbetweeners like Providence, there is a vague sense of hope of what can still be. Big cities don’t have time for such frivolity. When I decided to make the trip, my knowledge of the area wasn’t particularly deep. I knew that Rhode Island was the smallest state in the country. That Providence was its capital. That it was a seaport town. That it was small enough that I could easily get around by foot. And based off that, I thought it was a place I would like to go. As soon as I arrive in Providence, people tell me that I won’t find much to do this time of year. My only desire had been to take a boat ride on the canals that snake through downtown. But as if to prove everyone right, I learn that I have missed boat season by a week. If I had planned better and not booked my plane ticket two days before departure, I would have learned that the best time to visit Providence is during the summer months when the weather is amenable, the outdoor activities plentiful and the options for day trips to the beach exist. But I am impetuous, so I am here now in November when the sky stays gray, the trees are stoic and the Providence Place shopping mall might be the most popular place to go. But where I lack in foresight, I make up for in curiosity. Though I have little experience navigating icy sidewalks and have come ill-prepared with woefully inadequate shoes, I take off through the streets of Providence to learn something of this town. It is a city made for walking, and it opens up to reveal itself the deeper you fall into it. With one of the most extensive collections of historic architecture from the 18th- and early 19th-century, the city is the attraction. 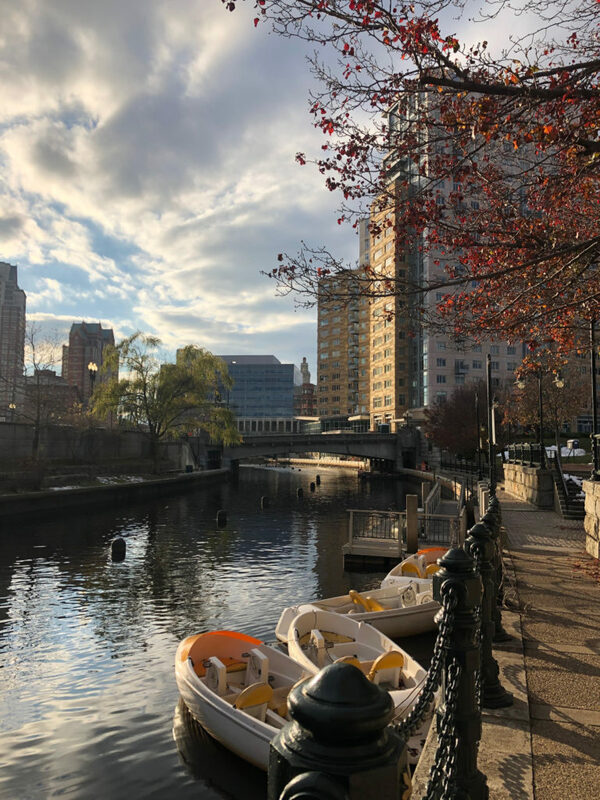 Founded in 1636, Providence is one of the oldest cities in the U.S., and it first flourished in the shipping trade and later helped give birth to the American Industrial Revolution as one of the first cities to industrialize. 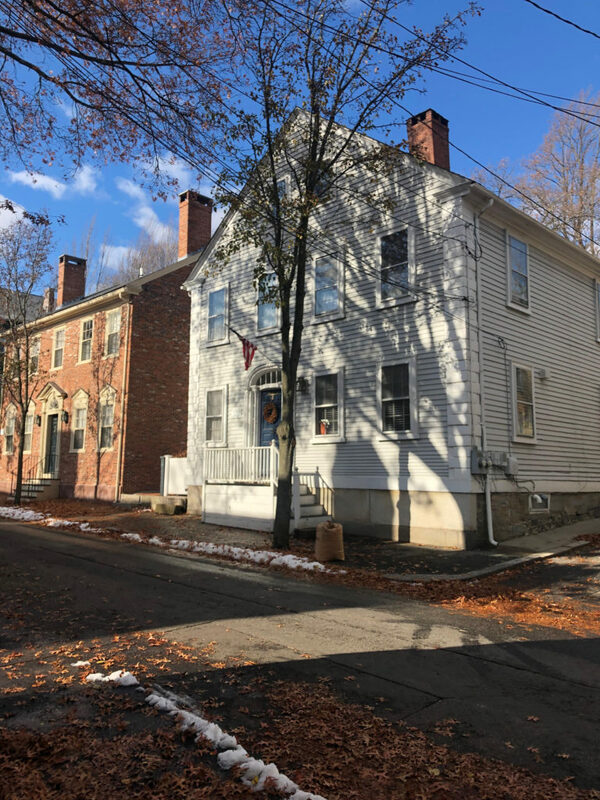 You can still feel the heartbeat of history here, because organizations like the Providence Preservation Society have seen to it that public buildings and private dwellings were revitalized instead of demolished. I have a sentimentality for history, not because of some fetishism of our past that we see in politics of today, but because as citizens of this country these are our collective stories, and it is incumbent on us to learn from them. Too often we think progress comes at the exclusion of the past, but Providence has managed to hold onto its history while also building its future. Providence is not a destination city in the way that other places are; it is still coming to be. But where other major urban centers are starting to dim, Providence is getting brighter. The city is brimming with restaurants like Gracie’s and Birch that are daring to be different. Home to the Rhode Island School of Design (RISD) and host to major public art installations like WaterFire, it is a bastion of creativity that is outsized for the city. I leave wanting, but I am intrigued by what the future can hold for this budding locale. Later, I am asked about Providence and if it is a place I might like to live. No, I don’t think so, but I might like to come back in the summer when the sun is shining, the flowers are in bloom and the boats are snaking through the canals.